Subwoofers originated sometime in the 60s, but their popularity skyrocketed in the 70s, arguably the music era tipping point. Today subwoofers play a very important role in completing a surround sound, or home theater system. So whether your hope is to being able hear the rumbles from your favorite action movie, or feel the beat drop in your favorite song, AIC can help you in choosing a subwoofer that fits your audio/video needs. It’s important to understand that subwoofers project sound in all directions, they don’t have to be facing the listener. However, both powered and in-wall subs are unique in their own way. The obvious main difference is that powered subs sit on the floor and in-wall subs are flush mounted to the wall, or installed inside of the wall. Another difference is that powered subs already have a built it amplifier, most in-wall subs do not, meaning an external powered amplifier may be needed. But don’t let that deter you, in-wall subwoofers are still an excellent choice. These in-wall subs are a great option for those who are looking for an aesthetically pleasing listening room, while saving floor space, without sacrificing audio performance. 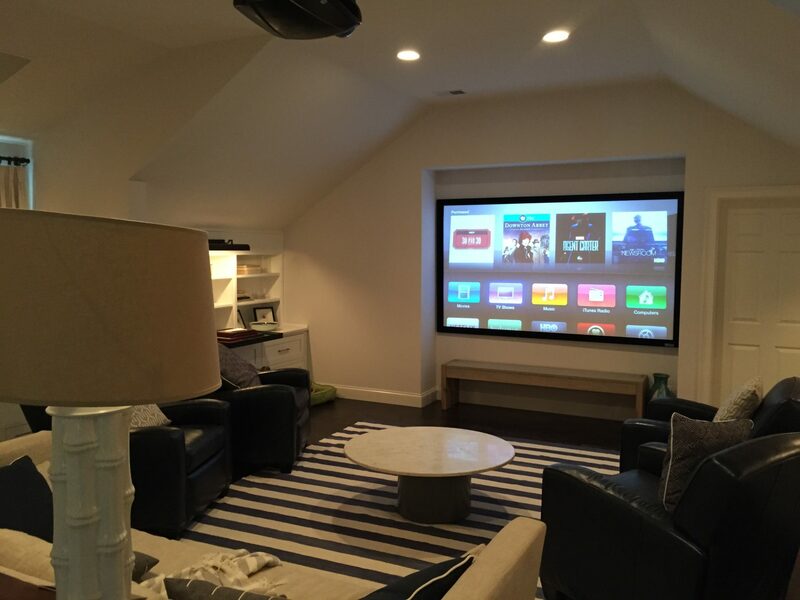 Whether you want a complete home theater, a media room or listening area, there are several options to choose from. Furthermore, don’t let the image of the installation process avert your decision in choosing these type of speakers. You don’t necessarily need to be building a brand new home or begin a major remodel, they may not be that intrusive. To ensure this alternative is right for you, contact our design team; we’ll perform a complimentary walk-through of your home. These traditional subs are the most popular option. Just like any speaker there are many options, but in our opinion there’s a little more that goes into making a decision. For example, will a front facing or down facing sub work better? How about both? How big do you need the amplifier to be? Do you want sealed or ported enclosures? Furthermore, although there are ways to conceal a subwoofer, typically a powered subwoofer will be easy to spot. Choosing one that will blend in with your other speakers and other audio/video components is something to consider. Advanced Integrated Controls has partnered with JL Audio, Martin Logan, Sunfire, Sonance and KEF to offer our clients the best options available for a subwoofers. Understand that you aren’t alone in deciding which home audio system will work best. We have over 10 years of experience in keeping our clients Connected to the World. We take pride in designing and installing Subwoofers projects in homes and businesses throughout Hilton Head, Bluffton, Palmetto Bluff, Savannah, Beaufort, and surrounding areas. Call us today at (843) 836-5700 to discuss getting your project started!